This morning I looked for a picture of one of my quilts (not this one) and discovered it’s not on my blog. Under the Finishes on the right hand side are the subpages which show quilts that I’ve finished since I started blogging in 2009. This quilt and the quilt I was looking for were finished prior to that. 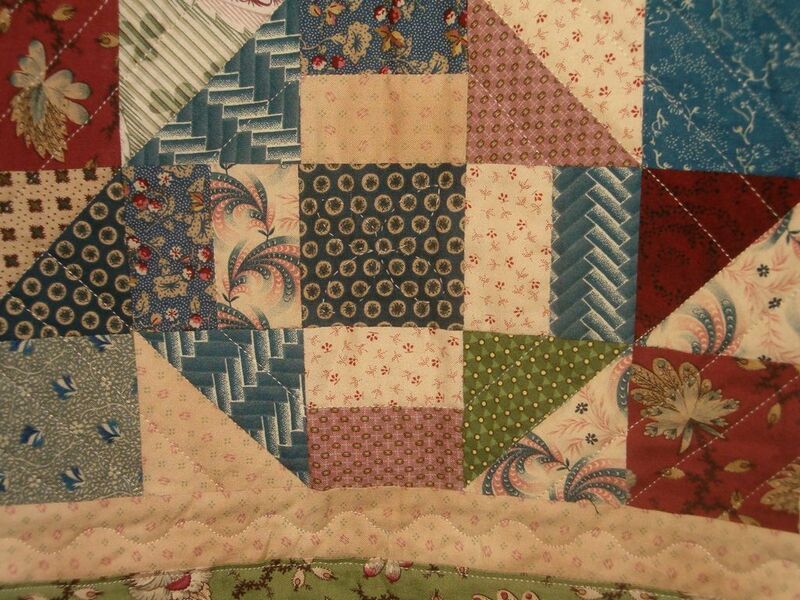 So, periodically, I think I’ll pull pictures and write about the quilts, and create a subpage for my older quilts. 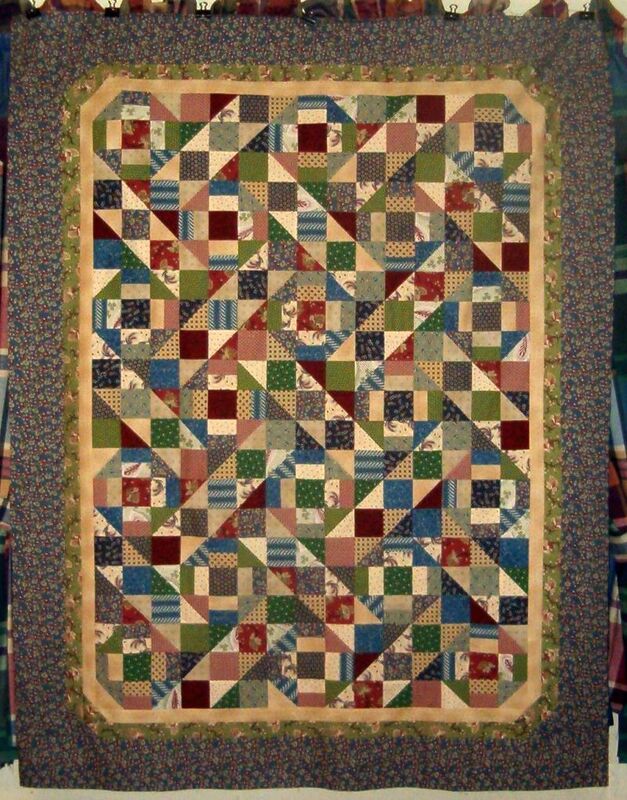 The quilt pictured above I finished on Mother’s Day (May 8th) 2005. The pattern is Grandpa’s Best from Perkins Dry Goods. 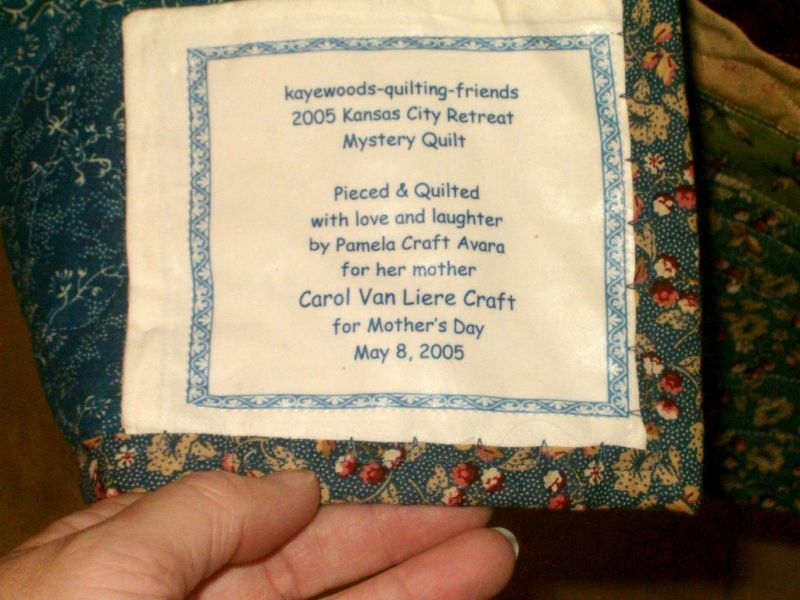 I started it at my first quilt retreat on April 29, 2005. The quilt was offered as a mystery so I picked blue, green, red and neutral FQs to go with my mom’s newly recovered sofa. Turns out most of them were Civil War reproductions. It measures 54″ x 69″. I quilted this on my sewing machine and used Quilter’s Dream Cotton for the batting. I started to go back and do a bit of hand quilting, but quickly realized that wasn’t going to happen. If you click on the picture you can just barely see the hand quilting in the center blue square. I was stitching down the label about 1:30 that day just in time to swing by my LQS where I bought the fabric and then go out to my mom’s to give it to her.